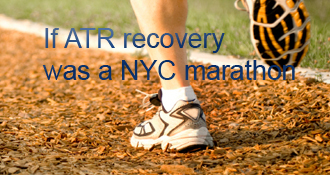 briand has completed the grueling 26.2 ATR miles to full recovery! I go back the surgeon in two days - that will be my 2-month follow-up. I removed the final wedge from the boot this weekend and definitely could feel the difference. The next morning was the sorest I’ve been since walking. I’m pretty acclimated to walking in the boot now and can keep pace most of the time. Toward the end of the day I definitely have to slow down and give my heal a break - it takes a pounding. I have not started PT, but am planning on the prescription at my next DR visit. I do some quad and hammy stuff and some simple ROM. My surgery foot/lower leg has stayed slightly puffy - I wouldn’t say truly swollen - the whole time I’ve been in the boot. I’d probably do myself a huge favor to (r)ice it down in the evenings. Rarely do I find I’m uncomfortable, but on a few occasions I’ve reached for the Motrin and it has worked fine. My poor tiny calf is ready to start the climb back to former status. And my swollen belly is ready to return to less-swollen. I’ve gained about ten lbs in the last 9 wks - all in places that make my pants not fit. Let’s bring on some PT! My ATR happened almost two months ago now. As I tell everyone, I was on the soccer field - they automatically assume I was destined to have an injury since I play soccer. I was only pushing off to start a run and POP - I hit the deck, knowing what had just happened. Why did this happen? You got me. I’m going to split credit with: 1: Almost no warm up or stretching before this particular outing, and 2: I’m heavier than I once was. These two excuses may or may not relate to the reason for the tear, but that’s what I’m going with. I was planning on going a couple hours out of town to visit family the following morning. I knew there was a Bone and Joint Urgent Care where I was headed so I waited to see any healthcare professionals until the next morning. A physician’s assistance diagnosed me and got me a script for an MRI to be done when I got back home. He did recommend that I slow down and take it easy at this point in my life - thanks for the sermon, buddy. I left the clinic only to notice that the PA was leaving on a motorcycle - what a hypocrit! Then there was business office trouble. MRI’s have to be pre-authorized and the prescribing place sent it to the wrong imaging place and things got a little crazy for a few days. I ruptured my tendon on a Friday, so by the following Tuesday I find out that I don’t have an MRI scheduled. Finally get that scheduled for the following Monday. I got an appointment with the OS two days after that. OS confirms what everyone already knows and sx is scheduled for two days from then. So my surgery is exactly two weeks post injury. Excited for surgery! I’ve been laid out with ACL reconstruction a couple times, so I’m thinking surgery is just a blip and PT starts the following week. Not even close. Have surgery under GA and awake to the nurse in recovery trying to see if I’m actually cognicent or not. I asked her, "What are you giving me?" She says, "Demorol" and I tell her she does good work. Next few days is all about not feeling pain, right? Rx 40 tabs of Percocet 10 and a balancing amount of beer and the next two days went by quick and painless. By day three I was only taking the oxy 2 times a day and totally off by the end of the week. Man is that stuff addictive, but luckily constipation - notsomuch. Time for a 7 hour car ride. Perfect timing for this injury with the "last" wedding of my youth to attend. I’m 33 and I’ve been going to weddings far too much for far too long and this one was that light at the end of the tunnel! The couple was more friends of my wife, but I felt like I could do this. Long story short - I survived. I will not go on any road trip 7 days post-op achilles repair ever again. Nashville was beautiful, however. The week I got back from my trip I went in to have my splint and stitches removed. "Everything looks good," was about as much as the doc was involved. Got a shiny black cast and made an appt for four weeks. Four loooooooooooooong weeks. And so began the "worst of times". In all of this, I have only taken 1.5 days off of work. I have been fortunate to keep my leg up through the day while at work, but the situation is obviously not ideal. So in the early part my days in a cast, that’s when I started getting down - especially in the evenings. I’ve always helped my wife (5 months pregnant) with the evening routine of dinner, dishes and our two year old. Not to mention we have a huge garden going right now and everything just seemed overwhelming. So I sat on the couch, leg up. Day after day, evening after evening. This was the norm until about a week before my latest appt - apparently the excitement of getting my cast off was making my mood noticeably better. Between that and a marked improvement in the ‘blood-pooling’ phenomenom (that occurred at a moment’s notice in my foot if I stood up), things started looking up. A slight silver lining is that the World Cup started and the couch is comfortable. The fact that you got that as a reason makes me worry that your doctors may be sending you down the old slow path, which did NOT work as well as surgery, unlike the new fast non-op path. You can see 3 slightly different fast successful non-op schedules (protocols) at achillesblog.com/cecilia/protocols . Try to stay close to one of them if you can. Going slower non-op increases rerupture risk, as well as being a big nuisance. This is a great site for new atr victims and you will be able to learn much more about the condition, such as that, for most of us, non-surgical/early mobility really is the way to go. BUT, you really should expect more from your medical people - good communication between you and them will take away much of the worry and apprehension. Ask them questions, ensure you receive answers that make sense. That said, hopefully you will be receiving replies to your post which will inform and reassure you. I would add more but I have to rush off to work now. Bye for now and good healing. can someone see my words? I have just written a really long letter…where is it? Keep it elevated! I was right where you are a couple weeks ago. You’ll see a lot of progress once you start pt. Hey brian, I’m at about 8 weeks post op. I have found that soaking my ankle every night in warm water with salt followed by rom exercises, then ice has made a huge difference at this point. Swelling seems to be decreasing by the day. I felt the same way about pt, it was almost like Christmas. Good luck! What took so long in not starting your pt sooner? I can’t wait to ditch the crutches - congrats! It is a FANTASTIC feeling going ‘crutch free’ and FWB….. Well done, it gets easier every day! Congrats. Surprised you didn’t get any pt scheduled. I would think if dic feels comfortable with you not using crutches, hhe would get you on to pt. I remember thinking when I ruptured my tendon one year ago today, “well I have to miss my triathlons for the rest of the summer, but at least the immobility will be over in 8 weeks and I can join the team again for run training.” My goodness, I had no idea what was ahead of me. Work to get yourself strong so that when that second baby joins your family, you won’t have huge setbacks from overdoing it. It is always hard for me to remember that I would be there for my husband without a doubt if the tables were turned. That is the gift of a partnership. Go USA!! Next time (if you ever join out “2-timers” club), skip the Sx! You can also skip the cast, and a few weeks of rehab, and probably the wasted 2 pre-op weeks too! Added the widgets. I agree with the therapeutic part - I would have done good to start this blog sooner! briand’s AchillesBlog is proudly powered by WordPress and WPDesigner..